Personal Service Announcement: If there is one project you should hire out, it is definitely installing wood plank tile in your whole house. In case you are wondering, yep, we are still slowly tiling our whole house. Forty, no, fifty days? Times a hundred it would seem! Anyway, that project isn’t going to be ready to share for another 300 days (it seems), so I thought I would share a quick DIY I did last Monday while Chris was working on his car and other people were complaining about Columbus. 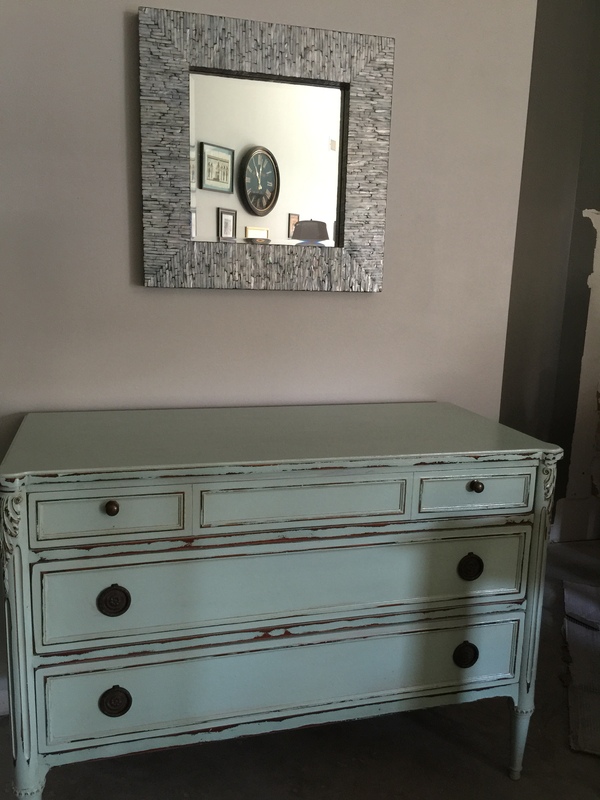 For the last 15 years or so, I have had a very functional jewelry armoire (from Service Merchandise–remember those days?) that my parents gave me. However, our recent NYC-apartment-like living in a fraction of our house’s square footage has amplified the need to eliminate some furniture pieces that aren’t working quite as hard as others. Let’s be honest: Sleep is essential; jewelry is not. 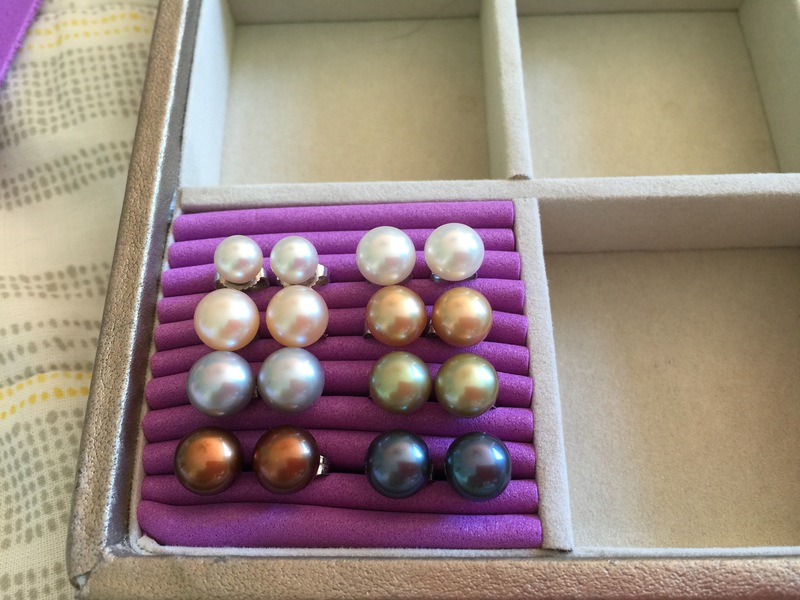 I realize this may sound like treason to some, but my engagement + wedding rings and a pair of pearl studs are just enough bling for me most days. 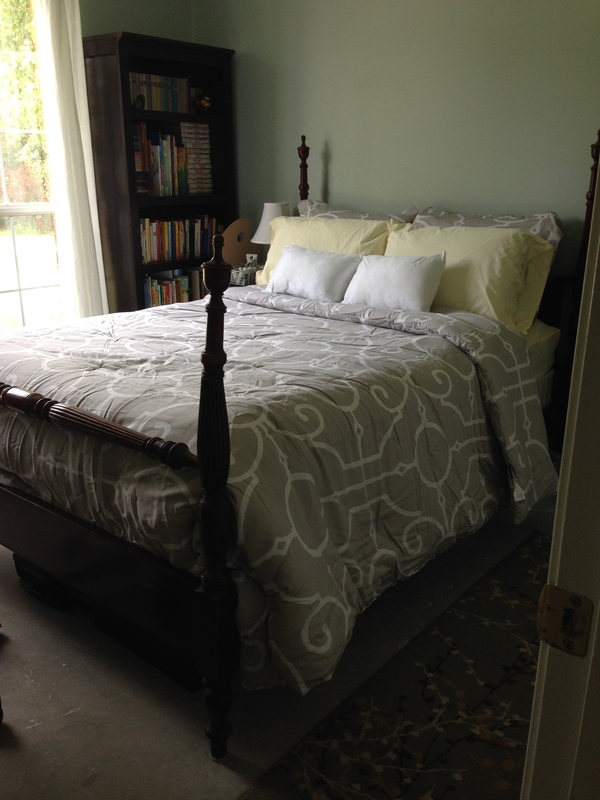 Ergo, the bed is in; the armoire is out. 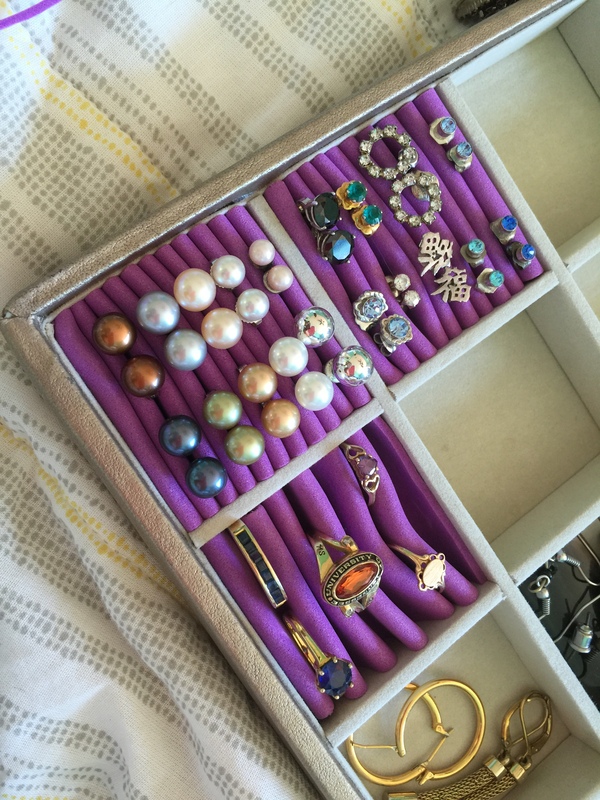 A couple of years ago, my mom made the decision to sell her jewelry armoire (purchased at the same time as mine) in the interests of having more floor space, and she has never looked back. I decided it was time to follow suit. 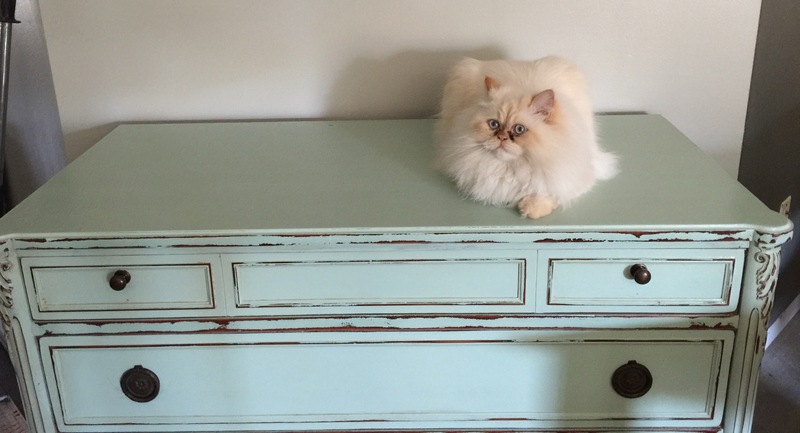 I’ve noticed a trend in open jewelry storage, but I’m not a fan for two main reasons: (1) dust (2) cats. If you cycle through all your necklaces on a regular basis, you probably don’t have to worry about dust settling on your jewelry, but I would…and dust mites really aren’t a great fashion statement. In addition, we have cats that like to play with shiny, dangling objects (and one that likes to try to eat them), so this is a no-go for us. 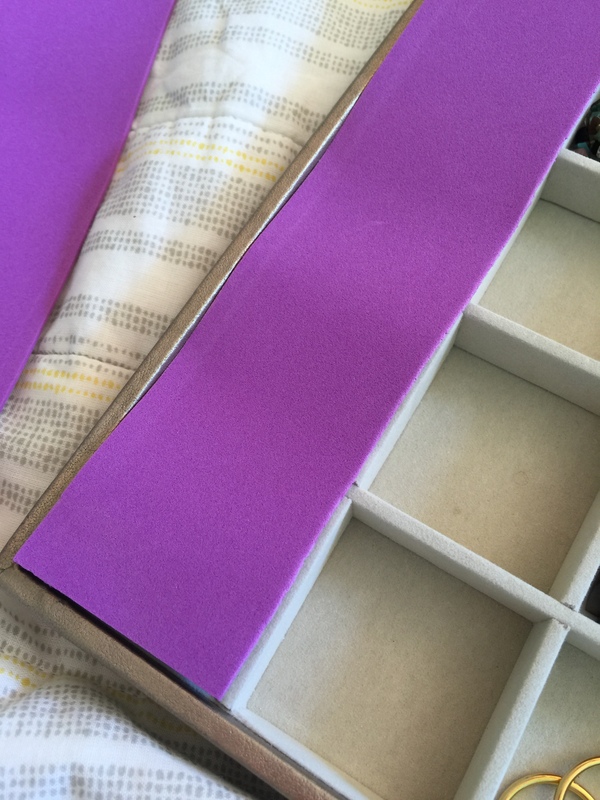 My mom has been using these stackable jewelry boxes from Bed, Bath, & Beyond that keep her jewelry dust-free, and I opted to do the same, with a DIY modification. 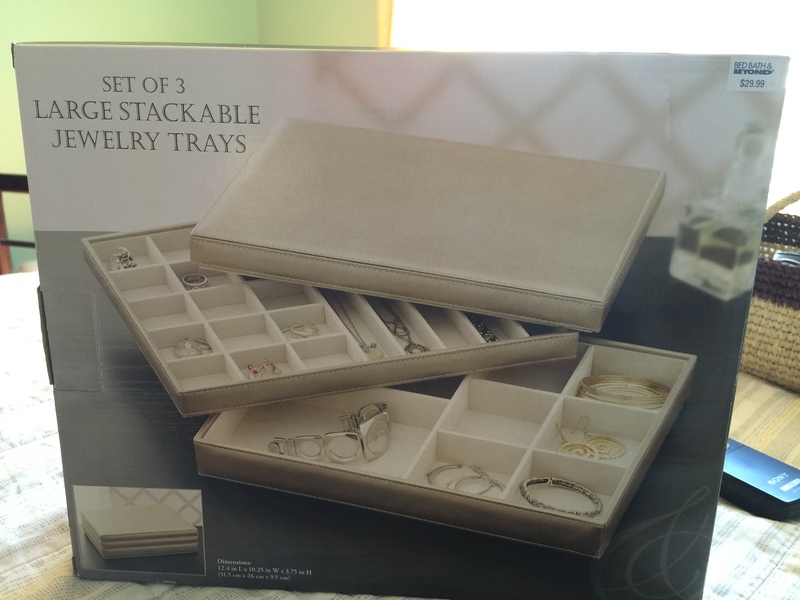 The set of 3 stackable trays (a bit misleading because it is really 2 + a lid) is a better buy than the separate individual trays, but the set doesn’t come with the tray with the ring/stud holder that is the very best part of my jewelry armoire. Womp, womp, womp. Typical marketing/sales ploy. Rather than pay $20 for the add-on section at the same time, I chose to make my own, using leftover craft materials. I didn’t have anything comparable to the velvety lining on hand, so I grabbed some craft foam. 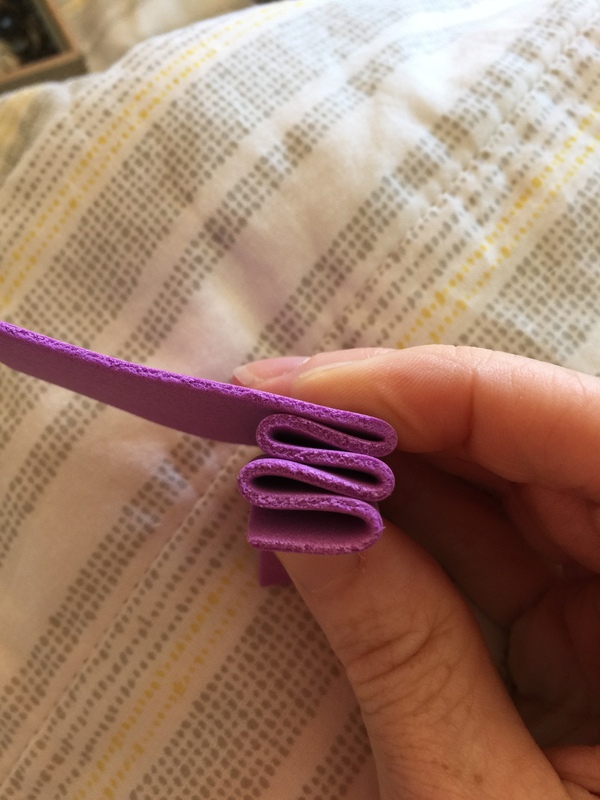 I simply cut a piece of foam to match the width of the smallest compartment, then folded it accordion-style, with each fold being slightly less than the height of the compartment, about 1/2″ long. The folds also give it the sections needed for inserting rings and studs. I used tighter folds for the studs and looser folds for the rings, and both are working just fine. Eventually I may purchase the real deal (with a good coupon! ), but for the 15 minutes it took and the $20 savings right now, it was a nice quick fix to tide me over until then! Eventually, once the rest of our floors are finished, we’ll move some pieces back into the rest of the house. Others we hope to re-home via Craigslist and our neighborhood’s fall yard sale, as we really have too much furniture for our small home. Perhaps this is why Chris was rather surprised when I brought home a new piece of furniture Friday. Crazy? Maybe, maybe not. For awhile now, I’ve been looking for just the right piece of furniture to provide storage for our home “administration station.” I’ve tried to use our existing furniture (and various combinations thereof) for this purpose to no avail, as our mail and papers usually end up piled up on various surfaces around the house. We pay our bills on time but procrastinate when it comes to all other things paper-related. Keeping files obscured in file cabinets or other closed containers means out of sight, out of mind. If we can’t see the papers, we don’t do anything with them either. On a side note, isn’t interesting that our lack of action (allowing papers to pile up instead of dealing with them straight away) enables inanimate objects (stacks of papers) that are otherwise unable to act independently to wield power over us? By not going on the offensive against paperwork (aka procrastinating), we must always be on the defensive, perpetually fleeing from or fighting an inanimate object! So what’s a family to do? At 48″ in length, it is well suited to our small space, but its drawers are deep and wide, providing sufficient storage for all of our things. I talked the salesperson into reducing the price and making a slight repair before bringing it home with me Friday. Before buying, I inspected the workmanship and the original furniture marker, which turns out to be John Widdicomb of Grand Rapids. Based on the particular label, our piece is from the 1940s–not exactly an antique but definitely vintage. Sometimes the thrill of the find is equal to the thrill of the hunt! In the next post, I’ll explain how I plan to utilize this piece to improve our paper problem. As for now, Hermes has claimed it as his own. If you are a hobbyist or DIYer, you well understand the need to have a collection of materials waiting to be put to good use–and the need to get a handle on storage of said materials before your garage/attic/basement/guest bedroom/linen closet becomes the Monica closet, or perhaps a cemetery for best laid plans and good intentions. Here lies industrial shelving attempt #1, behind all the tile samples underneath all the wood for the Ana White farmhouse table covered in two inches of dust and sand from the beach toys used three vacations ago..or was it four? You get the picture. Since last May, I have been struggling to find a place where all of my art and craft supplies could be kept and to find a prime place for working on my school stuff. The desk I use for schoolwork right now is also the desk I normally use for my sewing machine and supplies, but both cannot occupy the same space at the same time. #physics Enter the mail center. This mail center was a housewarming present to us from Chris’s paternal grandmother eight years ago when we bought our first house. It came from Pier 1, and it served us well in our first house and later in the townhome in the city. For some reason, it has not been functional here at the beach, most likely because it is not conveniently located to the entryway of our home. Rather than serving as a mail/paper processing station as usual, it is a clutter catcher, with piles of mail and other random things. In fact, the mail center had become the junk (drawer) center of late, which was unacceptable. Inspiration hit when I realized that the cubbies in the mail center would be perfect for storing yards of fabric–and for controlling the quantities that could be stored, resulting in a more manageable stash. Better use of mail center? Check. Better storage for fabric? Check. Less compulsive spending and buyer’s remorse? Check. Check. 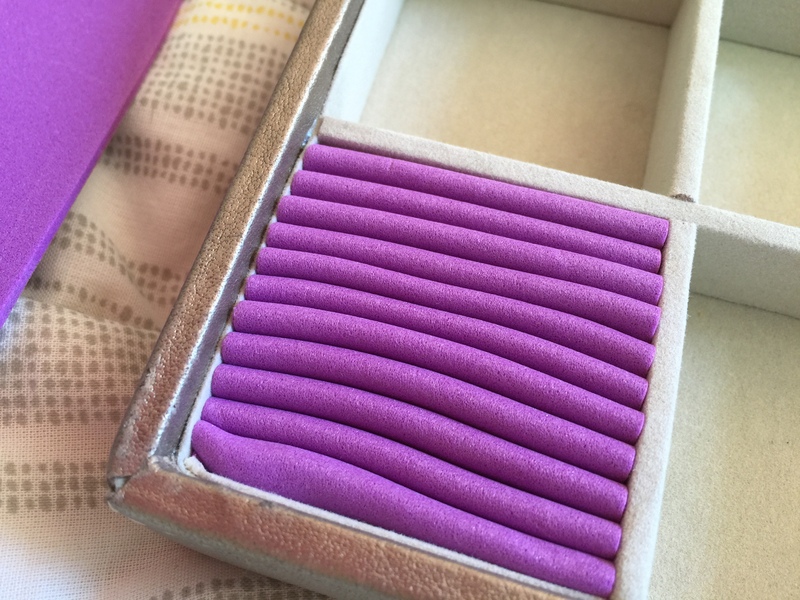 This solution would probably not work for people who sew regularly and need to store vast swaths of fabric, but for an on-again, off-again project crafter like me, this was an ideal match. 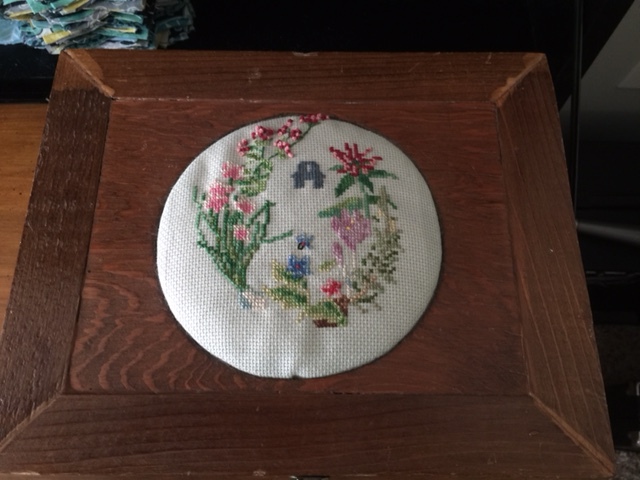 My sewing supplies and scraps fit in the drawer or on the top shelf of the bottom cabinet in glass storage containers we got as a wedding gift almost nine years ago that used to be in our kitchen. We don’t have room for them on our counters now, but this is turning out to be a great way to repurpose them. The mail center is not intended for a heavy machine to perch precariously on the end of the pull-down desktop, so I do not plan to sew here. However, on the other side of this rather useless pass through area in the center of our house is a hand-me-down sofa table that I had been temporarily using for sewing anyway when I had the time. Nearby is our dining table, so I can just pull a chair up to the sofa table, set up the machine, and sew to my heart’s content while watching, er, listening to reruns of Fixer Upper. Watching might result in bleeding fingers. Not recommended. Best part? When I’m not sewing, it all closes up, and no one will ever know that this is a mail center fabric hoard sewing station. We’ve continued our fall organization mission in the kitchen. After the guest hall closet and the master bedroom closet, the kitchen pantry was next on our list. After taking down our upper kitchen cabinets, we are maxed out on space, which means our pantry needs to be as organized as possible to handle some of the overflow.We don’t intend to keep this pantry once we do our major kitchen renovation, but in the interim, it has to multitask as food storage, appliance storage, and storage for portable food storage (cake carrier, trays, etc.). Here’s how the pantry looked Thursday morning before we cleaned it out. Not bad, but not great. Here’s how the pantry looked afterwards. Doesn’t look much different, huh? That’s probably true. We just shifted some things around to maximize the utility of the space. 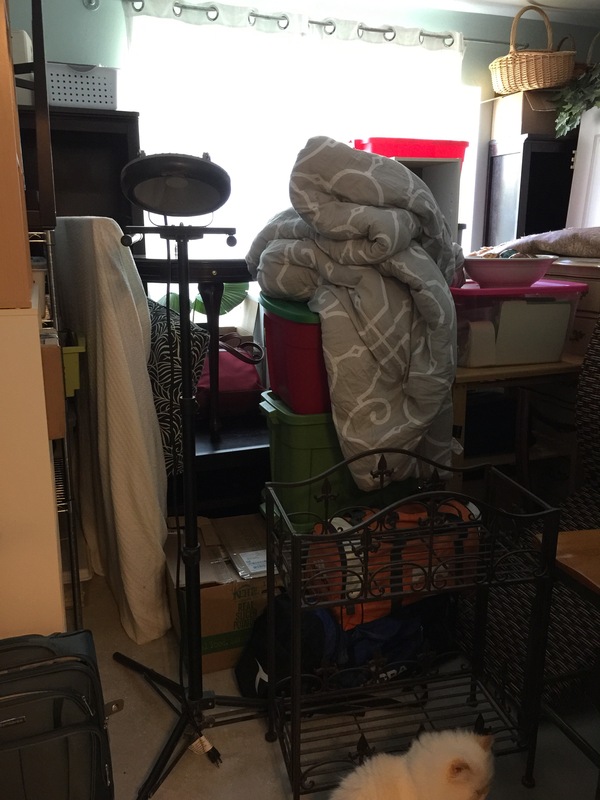 If you look carefully, you may be able to spot a few places with some extra room that didn’t exist in the before shot…as well as fewer things stacked precariously on top of each other. Speaking of stacking, one thing we really do love in the pantry is our collection of OXO POPs storage containers. Our measuring cups have plenty of room in them for scooping, and they easily stack, minimizing wasted space. The lids are easy to manipulate with one hand, and they clean really easily, too. The only difficulty we have with our OXOs at present is that the wire shelves were installed at a height that makes it hard to get the containers in and out when stacked on top of each other, hence why we leave a little space at the front to facilitate shuffling/tipping. It kind of reminds me of one of those sliding number sequence puzzles. I used dissolving labels for canned goods to label them so that when I empty a container and wash it, the label disappears. I can relabel to my heart’s content without worrying about having to clean off sticky residue or dealing with those “erasable” chalkboard labels that don’t come as clean as you might like. I really do like the looks of the chalkboard labels, but these serve a dual purpose in our kitchen, which means I already had them on hand. Labels are really essential if you want to ensure your family can differentiate between different types of sugar and flour; otherwise, your baked goods may not turn out very tasty. Voice of experience here. We did add an ancient Command hook for hanging our aprons. Much better than having them fall on us (or the floor) every time we open the door. Now everything in our pantry has a designated place, which will help both of us return things to their rightful locations on a regular basis, at least until we get to revamp the kitchen completely. Right now, we plan to move the fridge to where the pantry is presently located so that we can open both doors easily (the right side is hard to open because it is against a wall with a window). Instead of the kind of pantry we have now, we will do one of those awesome pull-out pantries that blends into the rest of our cabinets. So excited for when that day comes! Right now we are gathering ideas for our design board. Hopefully we’ll get to share that soon! Now that the KaZoos have made almost all of the small and affordable repairs and improvements they can at this juncture (except for a few things needing to wait until cooler weather later this fall), Mista Lista will only be sharing seasonal updates on their home improvement progress. These home improvement to do/ta da posts will come at the end of November, February, May, and August. Not to worry, though: Mista Lista will be sharing other to do and ta da posts that focus specifically on certain projects that are receiving some KaZoo love in the interim months. Let’s get this party started! 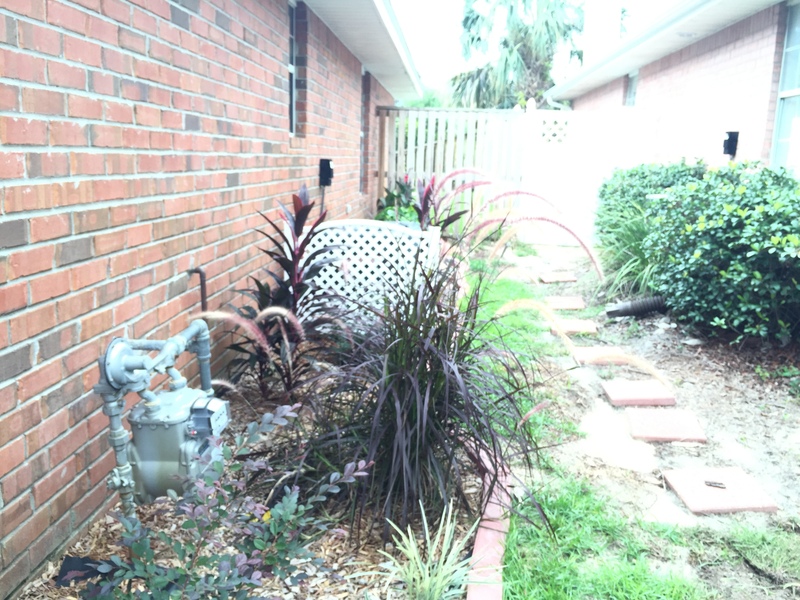 Our neighborhood HOA has a policy (not always well-enforced) that air conditioning units and trash cans should not be seen from the road, and while some people may not follow this policy, we happen to like hiding the yard uglies. My parents gave us a leftover lattice screen to hide our trashcan, and we bought another lattice screen to hide our AC for $17.13 (on sale at Lowe’s end of summer clearance sale). We also put down 9 red square patio stones ($7.83 also on summer clearance) underneath our trashcan, since the grass underneath it was dying from lack of sunlight anyway. We dug down the area so that the patio stones would be level with the ground for easily rolling the trashcan into place behind the lattice. Now if we could just hide the ugly meter in a way that would still allow it to be read…. Once the KaZoos started some of the more involved projects like installing the range hood, they realized that they needed a location to organize everything for their current and upcoming projects. 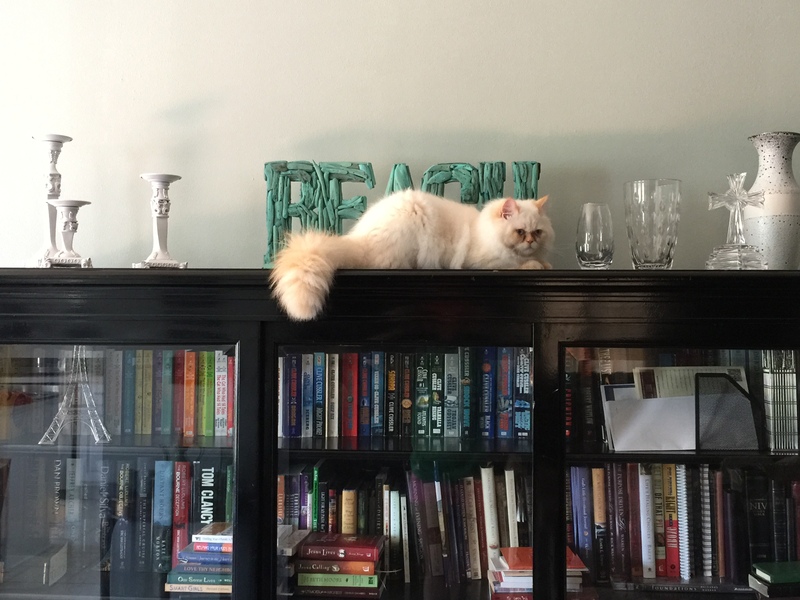 After putting away some clutter that had accumulated on various shelves in the garage, they designated one shelf as their DIY project shelf. This shelf holds all the smaller items they are/will be using for projects, grouped by project, and sequenced by order of project. Although one shelf may not seem like very much room for all of their DIY needs, this is one way the KaZoos are keeping their to do list manageable for the future. Plus, now Mr. KaZoo can fit his car in the garage where all of those things were taking up valuable car real estate. Mista Lista applauds the KaZoo family’s efforts to minimize clutter and maximize efficiency. When Mrs. KaZoo first arrived from the big city, her home office was set up in the front bedroom where she would be encouraged to work by the abundant natural light. Mrs. KaZoo knows she works best in natural light in an open, minimalist space free of distractions, and the front bedroom offered a nice picture window on the north side of the house. Plus, this would make the front bedroom seem like less of a space-waster if it could double as an office. Unfortunately, the cramped space in the front bedroom was cramping her thinking. Keeping the draperies open on the picture window allowed plenty of light but also plenty of heat, not to mention the constant distraction of neighbors passing by the window while she was working. At the same time, the KaZoos were feeling frustrated with their living room arrangement because they could not sit on their favorite couch to watch TV, due to the size limitations of the room rendering it impossible to have the media stand opposite the sofa. Plus, the living room was feeling very crowded with its oversized furniture awaiting a neighborhood garage sale in October. Mrs. KaZoo had an “aha” moment when she realized that the KaZoos could swap out some furniture with existing pieces in other rooms to solve both the living room and office dilemmas. When Mr. KaZoo came home from work one evening, they shifted the TV to a smaller TV stand, relegating the larger media stand to the front bedroom for media storage. The smaller TV stand fit on a smaller wall in the living room, allowing the sofa to occupy the longest wall opposite the TV. By putting the TV on the smallest living room wall instead of a bulky loveseat and moving a French chest to a different wall beside the piano, the angled wall was freed up for Mrs. KaZoo’s displaced desk. Now, both desks are in the living room area (making for a more functional office space), the KaZoos can watch TV from their comfy couch, and the front bedroom still serves a valuable double purpose as book and media storage in addition to a guest room. Having a media stand in that bedroom also provides a flat surface for guests’ suitcases, and we can eventually put a TV in that room if we so choose. Three birds with one stone, fools. That’s what Mista Lista calls efficiency. For under $100, the KaZoos completely redid their master bedroom closet, maximizing storage by reusing existing shelving from the garage. See these posts for other details: Part I, Part II, & Part III. You may have noticed that there are only ta da’s here and no to do’s. Say what?! Mista Lista and the KaZoo family have decided to set monthly project goals, so tomorrow Mista Lista will be back sharing the KaZoo To Do list for October. In last week’s great purge of our master bedroom closet, we cleared out our closet in order to scrape ceilings, paint walls, rip out carpet, and add more racks for storage, using leftover wire shelving from our garage that we took down to make room for paddle board racks. Chris also attempted to put on pants from high school. Spoiler alert: They didn’t fit. Then we combined forces to tackle the ceiling. Our usual prepwork involves removing the carpet, tarping off things we don’t want covered in dust, and then scraping the ceiling, but this time, we used the carpet as a floor tarp to catch all of the popcorn debris raining down since the carpet was going to be leaving anyway. I don’t recommend this unless you like slogging through a sea of popcorn ceiling and shag carpet while covered in drywall dust. We first tried the dry-method of popcorn removal–simply scraping away at it. Although this method resulted in fewer scratches and fuzzy places in the drywall, it was also considerably more tedious than the wet method we have used in the past. We normally use one of those garden sprayers, but ours had recently been used for weed killer, so we just used a regular spray bottle filled with water to mist the ceiling, rather than gassing ourselves in the closet. After waiting a few minutes for the water to saturate the popcorn, it came off in nice, soggy strips, rather than little chippy dry sections. We brushed everything down to get rid of residual dust on the ceiling surface, applied joint compound to areas needing to be smoother, and let that dry overnight. The next day, we sanded, brushed, and sponged everything down (again), after which we ripped out the carpet. After vacuuming up the residual dust and debris, we were ready to paint the ceiling. We decided to paint the ceiling the same color as the walls (Sherwin Williams Sea Salt) for three reasons (a) We have plenty of it. (b) It is not the typical white. (c) It is light enough to not make the closet feel like it is caving in on us while trying to find clothes in the morning. Chris holds rack while Amy marks one spot for height and width of crevice between wires for wall bracket. Amy uses level to measure and mark all spots for back wall brackets and side brackets. Chris drills holes for all back and side brackets. Amy and Chris hammer in the anchors and nail-ish things (we like to use the technical language for things around here, in case you haven’t noticed). The instructions said to tap gently, but the long wall had extra plywood backing that meant we had to break out our steel-driving John Henry skills. We’re fairly certain we woke up the neighbor’s baby doing this, which means our neighbors probably had a great Friday night. Except not at all. Amy and Chris snap wire rack into place and set into side wall bracket. Chris adds C-clamps for maximum support, using a manual screwdriver. The directions said to use 1 1/2 inch screws. This was a total impossibility, and we ended up using 1 1/4 inch screws instead, with much more success. Amy holds support arm brackets in place while Chris drills holes, taps in anchor, and hammers in the nail-ish things. After installation of all the racks, I sponge-washed the walls to get rid of residual dust from the drilling and vacuumed the baseboards and floor. Once we installed the racks in their new location, the closet started looking less like a secret safe room and more like an actual closet. Of course, adding clothes back in the closet helped with that, too. To plan the new location of our racks (and determine the measurements for our cuts), we inventoried how many categories of clothing items we had (i.e., how many skirts, pants, shirts, dresses, etc.) and decided where it would be best to hang the respective categories. We decided to do two long racks (keeping the existing long rack plus a new long rack cut from the garage shelving), one for each of us to hang our shirts and pants. With the residual section of the garage rack, we made another short shelf/rack for my shorts and knee length skirts to hang opposite the long wall. We trimmed an existing closet rack to fit the same wall for my long skirts and capri pants. We decided that a galley-like closet arrangement was more functional than the previous corner system that rendered part of each shelf useless for hanging items where they t-boned into each other. Plus, this provides easier access to the outlet and gives us a nice path for a runner rug. Not that room for a rug was a major part of our planning and decision making, but having a rug over the concrete floors (until we get our wood-look porcelain tile) definitely softens things up a bit underfoot. The mid-sized existing rack we raised a few inches to allow for long dress and suit storage for both of us, storage for my purses, and room for Chris’s shoes. While cutting the shelving, Chris noticed that the garage wire racks weren’t the same kind of rack as the ones already in our closet: They didn’t have the clothing “bar” at the bottom. Aesthetically, we thought it may not look the best, but after install, it is barely noticeable and is actually a functional improvement in some ways because the divided sections keep you from cramming too many clothes in one location.. Plus, if we upgrade to a real closet system down the road, we only have to live with the mismatch for awhile. Given my perfectionistic, OCD tendencies, I really thought it would bother me more than it does. Maybe I’m too short to really see the top rack, so I don’t notice the difference. I hung my flip-flop shoe organizer back over the door, and we mounted our coat rack behind the door to hold hats and scarves. On the left wall (as you enter the closet), we brought the 3 x 3 Cherry Cubeical back, which is currently holding my swimsuits, swimsuit cover ups, board shorts, work shorts, and work pants. Note: The purple labels hanging on the blue handles differentiate my ocean swimsuits from my pool suits. This may seem ridiculous to some of you, but if you have ever had a home with a pool, this may make some sense to you. Basically, if you wear a swimsuit in the ocean and then wear it again to swim in a pool, you can introduce algae to that pool, and algae (especially some kinds) are hard to eliminate from a pool. If you wash your swimsuit in hot water every time you swim in the ocean before swimming in a pool to “kill” living organisms, there still may be some algae stuck to it (especially if you have a lined swimsuit), and your swimsuit may now be faded and ill-fitting. A simple rinse of your suit between ocean and pool or showering in your swimsuit between venues does not suffice. Since I frequent both the pool and the ocean, I handwash my suits after wearing them and choose to keep two different sets of suits to avoid the risk of contamination. The middle sections of the Cubeical are currently empty (! ), but I’m sure they’ll be filled soon, too. We also added some interest to the wall in the form of a pinboard with a coral motif, a panoramic photograph of Neyland Stadium, and Chris’s diploma (because where do you hang those if you don’t have a dedicated home office or man cave)? My diplomas aren’t framed, so they don’t get a place of honor in the closet like his does. Maybe someday I’ll get around to framing my first two diplomas. Probably about the time I frame my third and final one. Which could be never at the rate my dissertation is going. Eventually we plan to upgrade the light fixture from its mushroom-like state, add the wood-look tile I mentioned earlier, and install a real closet system, perhaps with some additional shelf lighting to help with visibility. For now, our under $100 fix will work just fine. For Chris’s clothes, organizing was simply a matter of hanging his shirts from dressy to casual, followed by his pants, also from dressy to casual. My clothes required a little more work, and I organized them in a slightly unconventional way. I typically sort by kind of article and keep like with like: dresses with dresses, shorts with shorts, etc. For shirts, I normally vacillate between organizing by color and by category (business casual, casual) as the primary category, followed by type (sleeveless, short sleeve, 3/4 sleeve, long sleeve). On the one hand, I like organizing by color because there is just something harmonious about color continuity that I prefer, but I keep wearing the same tops over and over because I know how to pair them with other things to make outfits, rendering much of my wardrobe useless. On the other hand, organizing by category shows me more options for particular occasions, thus increasing the likelihood I try wearing something different than usual, but walking into the closet is a visual jarring experience that makes selecting anything difficult. When re-doing this closet, I decided to analyze my clothing pitfalls and use that to come up with a happy medium. I frequently find myself stuck in three kinds of clothing ruts: (1) I wear the same tops/outfits over and over. (2) I prefer casual to dressy. (3) I gravitate to neutrals. After having to conduct my dissertation research out of state and live in a hotel for six weeks, I re-learned the art of capsule wardrobes. I used to be good at this when traveling internationally. In high school, I took a small size carry-on for a month in Europe and laughed at all my friends lugging giant Samsonites up nine flights of stairs in Greece. I love the simplicity of capsule wardrobes. I am a minimalist at heart, so having a closet full of clothes overwhelms me with too many possibilities. Consequently, I’m planning to start cataloguing outfit ideas, beginning with my neutrals that I love. Rather than fighting my preference for neutrals, I’m going to use that as the starting point for developing my outfit building skills, essentially building a capsule wardrobe with neutrals as the base. My neutrals are sorted into three categories: up, up/down, and down, a.k.a. classy, convertible, and comfortable. Up clothes are dressier and more likely to be considered businesswear in a traditional workplace setting. Items in this category are more likely to closely resemble menswear and/or have an element of elegance about them, such as being made of better material, adding a touch of lace or silk, or creating an interesting neckline or back. Clothes in this category have a certain feature that makes them seem classy. I love gray, but I hate gray areas. The murky gray clothing area is what I call up/down wear, or clothing which can either dress up an outfit or dress it down. Clothes that could be considered business casual in a less formal work environment or in a trendier/artsy environment fall in this category. To qualify as an up/down top, the style and cut of shirt is likely based less on menswear and/or may be made of a material that makes it appear more casual. For example, the blouse on the left is an “up” blouse, but the one on the right is an “up/down” blouse because of the material and style. Note the sleeves of the blouse on the left are nicely cuffed, whereas the sleeves on the right blouse aren’t. I would wear up/down clothes when I’m wanting to appear put-together, but not necessarily needing to be “polished.” Here, the emphasis is on the versatility of the piece–can it be easily converted from work to play? Down clothes are items like basic tees and polo shirts–anything that is decidedly more casual or sporty. That’s not to say I wouldn’t throw a blazer over a tee and turn it into a work outfit (my default, in fact), but the tee itself has a dressed down, at home, casual feel, where comfort is king. This is literally my comfort zone when it comes to clothes. The rest of my tops are organized by color. Here at the coast, the weather is warm enough year round that having entire sections of my closet devoted to long sleeves is unnecessary, but because the air temperature can feel cool in the early mornings and evenings, even in summer, having access to all kinds of sleeves year round is essential. Consequently, I elected not to do the secondary sort I typically do by sleeve length. We’ll see how “the best of both worlds” turns out. Maybe it’s the former teacher in me, but something about back-to-school time starts the organizational cogs turning in my brain. Although the master bedroom closet was the first on the ‘hit list,’ this guest hall closet promised to be a much faster fix. 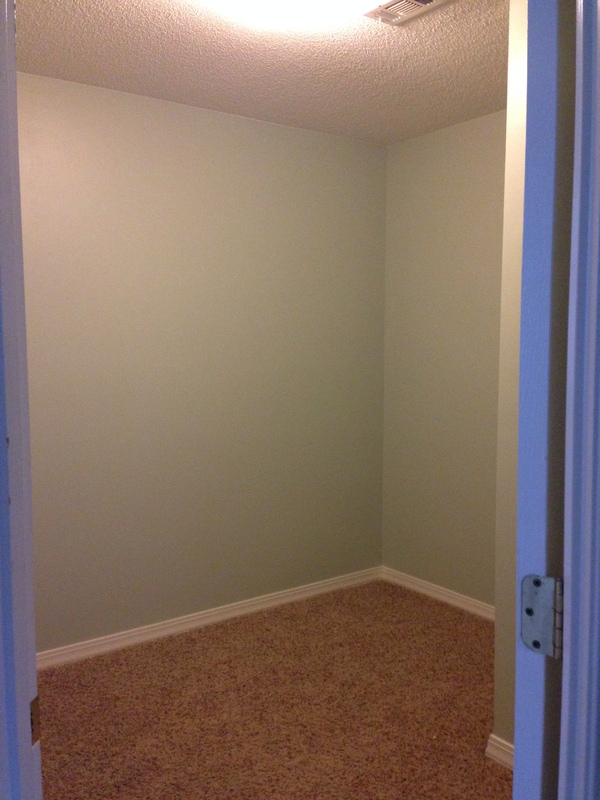 The longterm plan for this closet is to convert it to a coat closet. 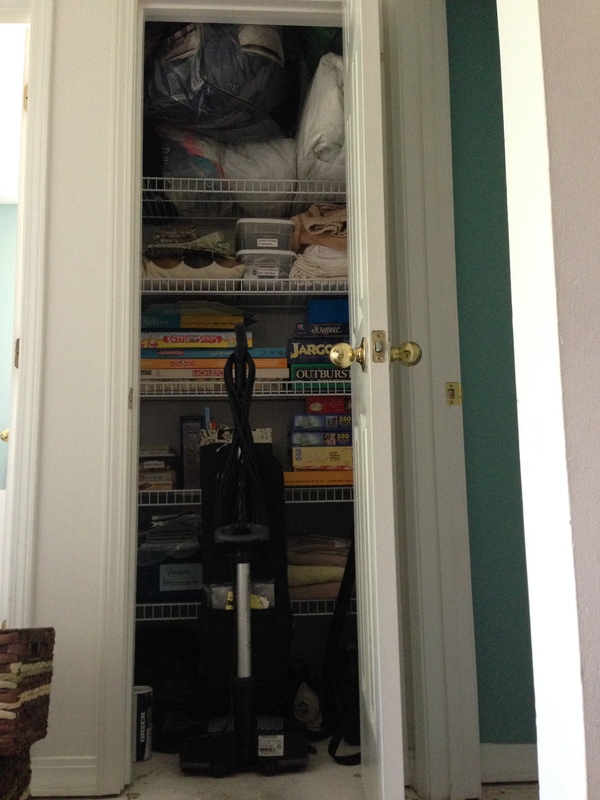 We have another linen closet, but we don’t have a coat closet right now. You’re probably thinking, Why would you need a coat closet in a beach house in Florida?, but we do get chilly nights on the beach and lots of rain. We also need a place to store our winter gear for when we travel to colder places to see family and because we do actually get cold weather down here–it even snowed on the beach this past winter! Right now, it’s serving as a multipurpose closet, which is the worst kind if you are an organizational nut like me who likes thematic storage. Nevertheless, I tried to organize things a bit better than they previously were, using some baskets and containers that I had emptied after our recent master bedroom closet purge (details to follow in another post!). First, I relocated items like the games and puzzles that were occupying prime real estate to the spare bedroom closet. Working my way up from bottom to top, I used an old laundry basket to store our air mattresses, pump, and sheet sets. Air mattresses never seem to go back in their original container, and they’re so bulky that I always have a hard time finding a way to store them. Not anymore. Now if we have more guests than we have beds, we can simply pull out the whole basket, and everything we need is in one place, just the way I like it. The two larger box-bins hold extra tissue boxes and toilet paper. Because you can never have too much toilet paper. Or tissues, if you have allergies like I do. The woven baskets hold vacuum accessories, decor not currently in use, and my sewing and quilting fabrics. The plastic containers hold curtain hardware, electric controllers for winter blankets and mattress pads, gift tags, and tea light candles. You can never have too many tea lights either. The plastic tackle box holds other sewing supplies like spools of thread and straight pins, the wicker utensil basket holds lint rollers, and the plain brown woven basket holds things that are beyond our abilities to fix, such as shoes to be repaired and a hand-me-down leather skirt needing alterations. One thing I have learned in over eight years of marriage is that Chris is better about putting things away if he knows exactly where to put things. Enter labels–they may look cute, but they are also extremely functional. I used fake luggage tags purchased from Michael’s a few years ago to label the smaller baskets and used regular mailing labels for the plastic containers. The larger bins and the laundry basket need larger, hardier labels, but it’s fairly obvious what’s in these anyway. Overall, this took less than an hour to redo. After putting the vacuum cleaners back in the closet, the labels are still readable and the containers still accessible. I’ll be opening this closet a lot more often now that some of my craft supplies are stored here, so we’ll see if this organizational scheme sticks. Even if we change this closet in the future, having somewhat of an organizational scheme makes me feel like less of a basketcase–at least for the next few months! We’ll be back on Thursday with a post about finishing the range hood (mostly). We took a break from working on the range over Labor Day weekend to do other projects and spend some time at the beach, so today we’re cleaning out the closet in preparation for our next mini-makeover: The Master Bedroom Closet. I love to organize. Chris does not. Nevertheless, he agreed to a purge and reorganization of the master closet recently. There’s nothing like that back-to-school time to re-organize a closet, even if you don’t have kids. Technically, I’m still in school, so that counts, right? When I first arrived at the ‘Zoo, Chris had taken over most of the master closet for himself. This was a problem once some of my clothes arrived. This was more of a problem once I arrived with the rest of my wardrobe at the end of May. A typical builder closet “feature” is the singleton rack that wraps around some, but not all, of the closet at a Goldilocks height (not too high, not too low, just right…for no one), making it impossible to add a rack above or below without yanking out the original, nailed-in rack, patching a million anchor holes, and starting over. 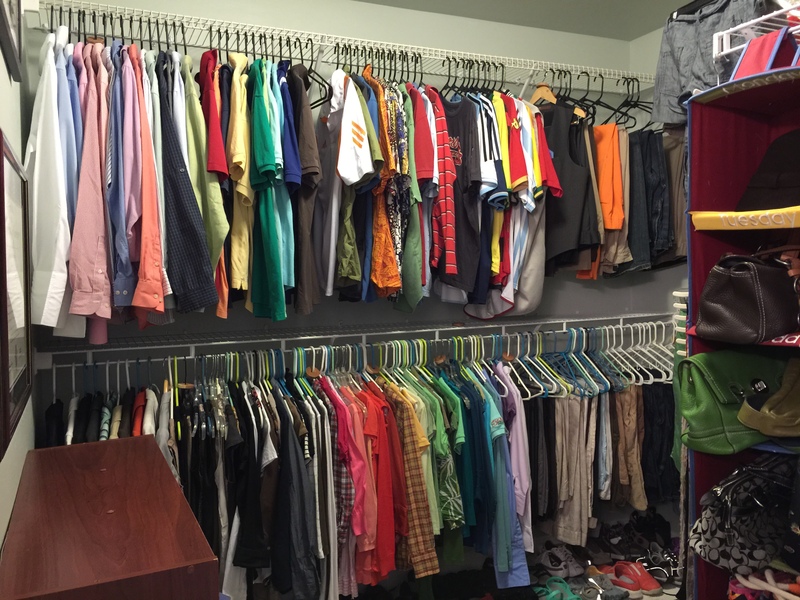 A single rack is never adequate for a master closet unless the sole occupant is a single male and even then, you may have a space issue if that male happens to like clothes or hoard clothes that don’t fit but remind him of the glory days of youth. Also in typical builder fashion, the closet has one wire rack that spans the long wall plus two shorter walls, each with another (smaller) singleton wire rack. The long wall intersects with one of the short walls, closing off the last two feet of long wall rack and/or the first foot of short wall rack from use because the clothes block each other. If they had used one of the curved corner sections of wire rack, this would not be such an issue, but it’s possible those weren’t readily available (for cheap) when our house was built. Thus, there is the appearance of plenty of hanging storage, but it is simply an illusion. The builder didn’t even try to put racks on the other walls, which is probably for the best because it would have multiplied the issue. 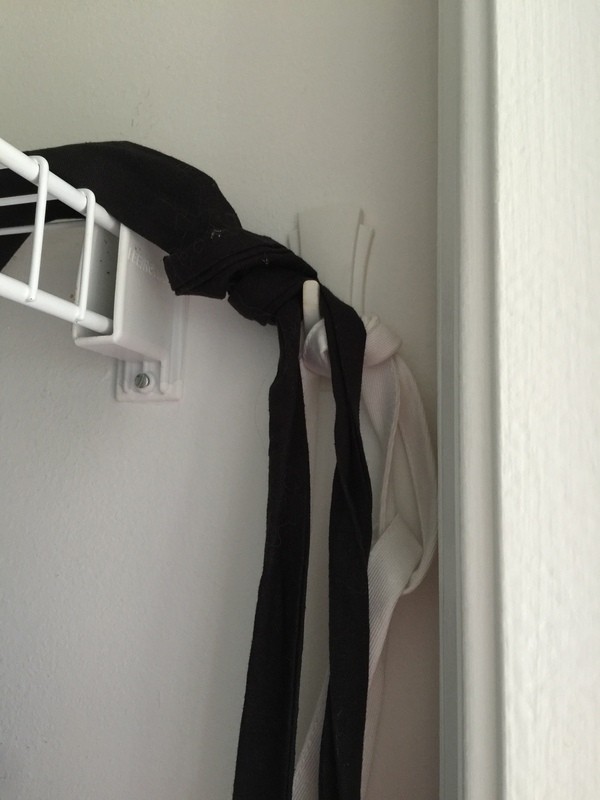 The third issue I have with our master closet is how many corners and awkward angles are part of the closet. The furnace room juts into one section of the closet, cutting off an entire section of useable space. The angled entry renders both the immediate left and right of it useless for storing anything but slender belts or scarves; otherwise, you can’t walk into the rest of the closet. Plus, the door swings to the right, blocking access to the singleton rack when you first enter, forcing you to shut yourself in the closet to access your clothes. 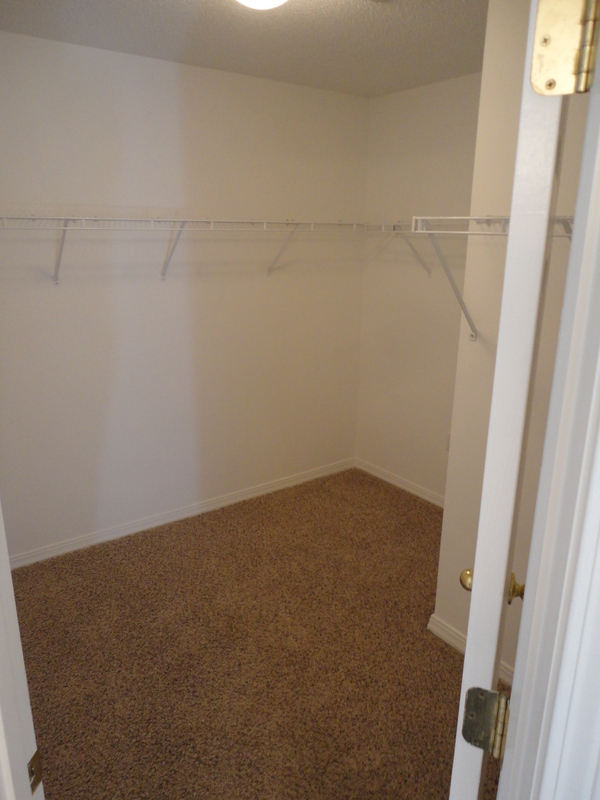 Although the square footage of our master closet may be alluring on paper, our walk-in closet feels only slightly bigger than a step-in closet. On the plus side, our closet will make a good storm shelter because it has no windows and is centrally located in the house (along interior walls only). On the minus side, the lack of natural light plus the dimmest, cheapest dome light ever make for a dark space. After moving to the ‘Zoo from the city, I discovered that Chris had been wearing shirts to work with holes and stains despite having enough nice shirts in the closet. He literally couldn’t see the stains and holes in the darkness of the closet. Yikes! So what did we do to troubleshoot? Find out next time…. Mista Lista’s last post gave you a sneak peak of some painting happening around the ‘Zoo if you were looking closely. Painting a whole house is s a slow process, especially when you are trying to work full time (Chris) and work part time/finish your dissertation (Amy). Between the two of us, we’ve managed to paint five rooms (and one room twice–more on that in a future post) since the beginning of March. 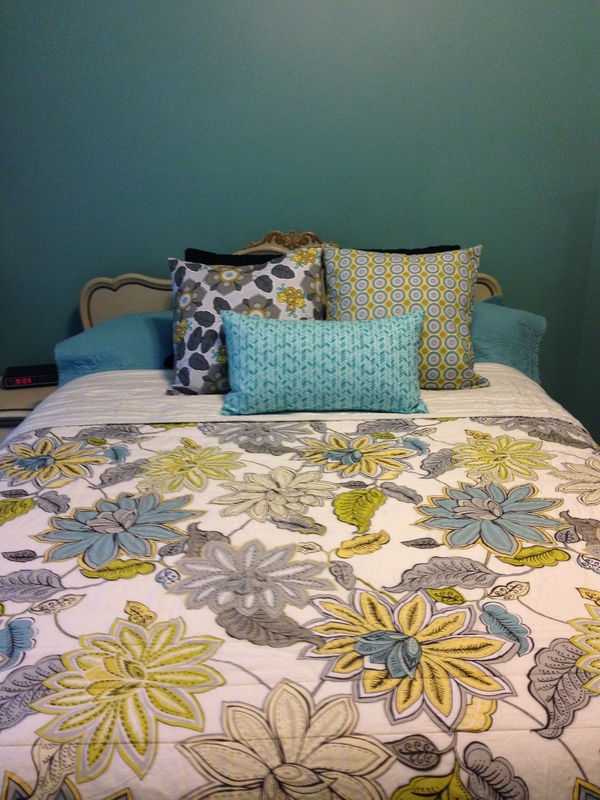 Isn’t it amazing the difference that paint (and furniture and bedding) can make? 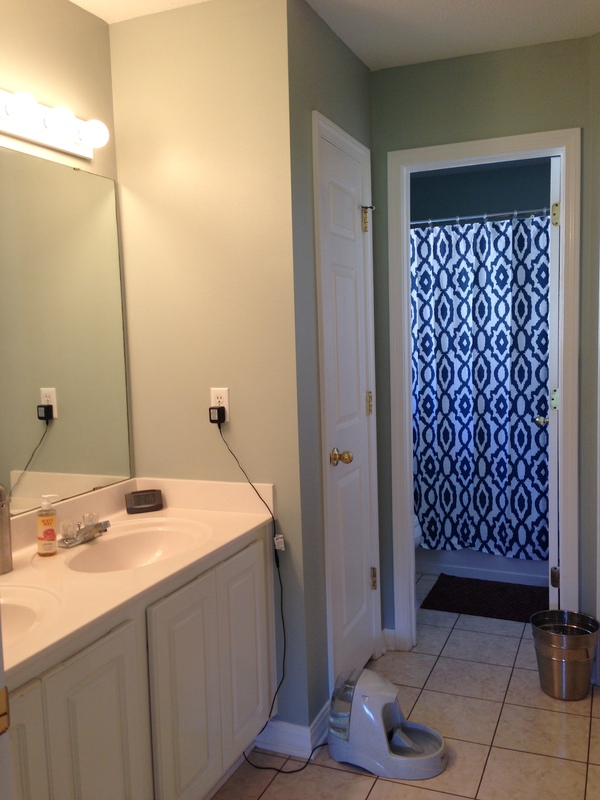 Our master bathroom is feeling a lot better now that it has been painted in Sherwin Williams Comfort Gray and has a new toilet. We’ve adjusted to the plastic seat, which is apparently a good thing since we can’t find a non-plastic Kohler seat that would fit with our toilet should we want to swap ours out at some point. We love the chameleon nature of Comfort Gray: As the light changes in this room, it shifts from gray to green to blue. 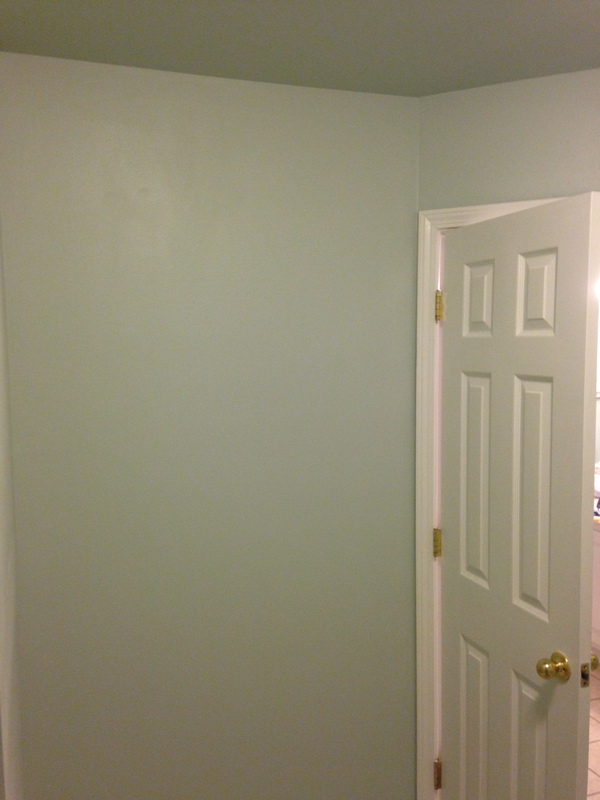 In the shadowy water closet/shower area, it even looks like a marine blue. Oh, and did I mention we have a new shower curtain, too? I found this at Target last Friday for $19.99. I wasn’t supposed to be shopping for home things since we had to shell out big bucks for the roof this month, but my mom had a coupon for $15 off a home purchase of $75 that she wasn’t planning to use. While I was at Target purchasing essentials like toothpaste, I took a tour of the home goods section and found this new quilt for the spare room bed. It coordinates nicely with some pillows I made last summer. It will likely become the quilt for the guest room bed once this room becomes a nursery, but right now I’m happy that the fabric helps the random assortment of antique white, white, and black furniture and the Drizzle paint color (Sherwin Williams) come together in a more cohesive, intentional way. Unfortunately (or fortunately, depending on how you look at it) the quilt was $69.99, so I wouldn’t get to use the coupon if I didn’t add something else from the home section to my cart…and that’s when I heard this shower curtain calling my name. Even without the coupon, the $20 shower curtain is still a bargain compared to the $50 one we had considered buying from Bed Bath & Beyond. Another change to the master bath involved the addition of some much needed storage in the form of a maple Cubeical that was previously snoozing in a closet waiting to be used somewhere. Even though our master bath has plenty of storage in theory, the deep wire rack shelves in the linen closet and the lack of counter and drawer space make storing small bath essentials difficult. We barely have room for soap dispensers and toothbrushes on the countertop. Seriously, builder, what were you thinking?! Ever notice that builders frequently make choices that don’t consider how a space will actually be used, other than for basic verbs (eat, sit, sleep, pee)? ALL. THE. TIME. Cubeicals are hardworking little things around the ‘Zoo, let me tell you, from books to crafts to bath storage. This one tucks away nicely behind the door, so you wouldn’t know it was there if I hadn’t just told you. The open storage is much better for accessibility and makes the best use of the otherwise dead space on that long, empty wall. I’ll continue to play with the arrangement of items stored here, but for now, it is helping make morning and evening routines faster. Chris even commented on how he liked having everything stored in the Cubeical. Yessir, we are making progress when the hubs actually likes and utilizes the organizational changes the wife makes.